How Music REALLY Works!, 2nd Ed. directly from the publisher at: Roedy Black Music Shop. 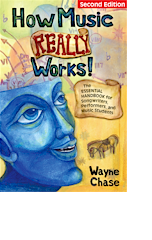 BOOK SUMMARY: HOW MUSIC REALLY WORKS! How Music REALLY Works!, 2nd Edition, focuses on specific techniques a player, vocalist, or songwriter can use to seize the attention of listeners and move them emotionally. For the benefit of the majority of musicians (amateur and pro) who do not read music, the book contains no music notation. Instead it provides in-depth, visually-oriented, easy-to-understand (and humorous!) text and graphics covering every important aspect of music-making and lyric-writing. Chapter 1: What Music REALLY Is, Who Makes It, Where, When, Why, presents a substantive treatment of the evolutionary roots of the human ability to make music. The chapter focuses on why music is such an emotionally powerful way of communicating. Chapter 2: What the Popular Music Industry REALLY Is, and Where It Came From, takes the reader on a tour of the major genres of Western music: folk/roots, classical, musical/film, jazz, blues, ragtime, country/bluegrass, gospel, swing, R & B/soul, rock/pop, reggae, dance/electronica, and hip-hop. Chapter 3: How Tones and Overtones REALLY Work, covers topics such as the harmonic series, how the various types of musical instruments work (including the voice), and the emotional effects of pitch, loudness, and tone color. Chapter 4: How Scales and Intervals REALLY Work, discusses the emotional effects of various types of intervals. Topics include scales used in the West, including blues and pentatonic, as well as scales used in the Arabic world, India, China, etc. Chapter 5: How Keys and Modes REALLY Work, covers the major and minor modes, and also the �Church modes�: Dorian, Phrygian, Lydian, Mixolydian, and Locrian. Other topics include tuning, temperament, transposing, modulation, and tonality. Chapter 6: How Chords and Chord Progressions REALLY Work, introduces a simple visual method of working out beautiful, original chord progressions. This chapter includes dozens of examples of songs with great chord progressions, and ends with 10 chord progression guidelines designed to maximize emotional impact. Chapter 7: How Beat, Pulse, Meter, Tempo, and Rhythm REALLY Work, begins with an examination of the role of memory in music, then discusses each element of rhythm (beat, pulse, meter, etc. ), how they all relate to each other, and how to manipulate the various elements to maximize emotional impact. Chapter 8: How Phrase and Form REALLY Work, highlights the differences between vocal-melodic phrases and structural phrases, and the central role of binary form. Chapter 9: How Melody and Melody-Harmony Integration REALLY Work, provides an in-depth treatment of melody, including many examples of brilliant tunes and why they work. The chapter presents 10 specific techniques a songwriter or composer can use to create emotionally powerful tunes. Chapter 10: How Lyrics REALLY Work, provides a detailed blueprint for writing lyrics that communicate emotional meaning in the strongest, most effective ways possible. The chapter includes 10 specific techniques for maximizing lyrical emotion and power. Chapter 11: How Repertoire, Signature, and Performance REALLY Work, closes Part III with a �how-to� discussion of a musician�s signature sound and style. Other topics in this chapter include dealing with stage fright and live sound mixing. Chapter 12: How the Music Business and Music Entrepreneurship REALLY Work, provides a look at, among other things, the elements of a performer�s public image. The chapter discusses the advantages and disadvantages of starting one�s own label vs signing with an independent or major label.